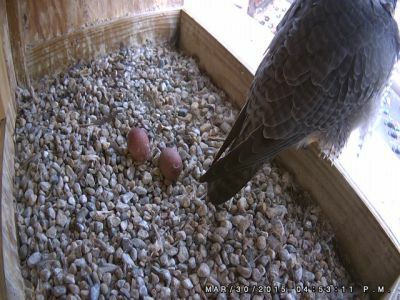 This past weekend was an exciting time for Kalamazoo Peregrine Falcons. First, on Saturday night, Rebecca laid her first egg, then drama ensued. On Sunday morning, Rebecca quickly became agitated and very vocal as a second male falcon entered the scene. He came to challenge Kewpee for his territory, and they fought in the area for about 3 to 4 minutes before Kewpee won the battle and the intruder departed. We are unsure of who the intruder is. Perhaps it’s the male from last year, or perhaps it’s a different one. At this point, it is hard to tell because the second male peregrine did not have any leg bands. Even though science shows that peregrines mate for life, there seems to be quite a bit of turnover in Kalamazoo. Less than twenty-four hours after the couple’s intruder, Rebecca laid her second egg. Rebecca and Kewpee are now alternating turns in staying with the eggs. Peregrine Falcons typically lay eggs between late March and May and begin based upon the increasingly long days, not necessarily the weather or temperature. It’s an exciting time to see if Rebecca will lay more eggs and how the chicks will do this year.